What does Christopher Columbus have in common with the man who said he wanted to eliminate all the photographers from the first day he took over the company that owns Chicago Sun-Times? Both were featured in a parade today, Oct. 14. 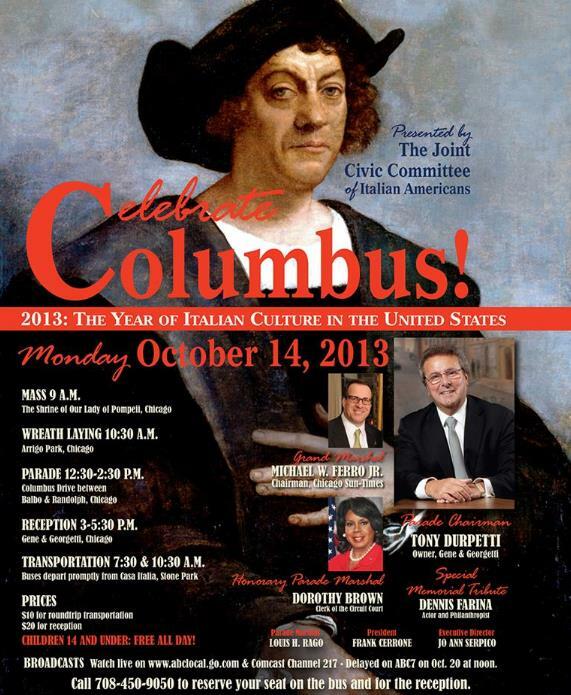 The Joint Civic Committee of Italian Americans selected Michael Ferro, Jr. as Columbus Day Parade’s grand marshal. “We don’t believe he was worthy of this honored position at this great event,” said Chicago Newspaper Guild Executive Director Craig Rosenbaum. Guild members work for Sun-Times Media, including many of the photographers who made media history after they were fired en masse May 30. Ferro is the chairman of Wrapports, the company that owns Sun-Times Media. What does he know about Columbus Day Parade and its significance to the Chicago area? His own media company no longer has photojournalists on staff to document the parade he is leading. From Chicago Newspaper Guild’s view, Ferro has crippled his company’s ability to cover the news in a meaningful way when the photographers were fired and replaced with reporters and camera phones. “That Columbus, or Cristóbal Colón (to give him his proper spanish name), was a slave trader is a matter of historical fact. He cut his nautical teeth sailing under a Portugese flag engaged in the african slave trade a dozen years before 1492. When easy wealth in the form of gold proved not readily available in the Caribbean, Colón resumed his slave-trading occupation by loading the holds of his ships with Indian human cargo headed for the slave market in Seville. That he was a thief is equally self-evident, however a high-level thief he may have been. The law of tribute that he instituted in the island he called Española sometime in 1495 forced Indian people on the island to surrender goods, including gold ore, can only be classed as armed robbery. And we will argue in this essay that Colón was indeed a murderer, culpable for those crimes against humanity as the head of an authoritarian regime just as readily as Adolph Hitler is held accountable for the murder of some six million Romas (the so-called Gypsies), Jews, and gays in Nazi Germany. What do Columbus and Ferro have in common? Neither could steer the ship – Columbus couldn’t find the Orient and then when he landed on an island in the Caribbean he said he discovered a new land that had been inhabited for hundreds or thousands of years, and Ferro is running a paper back into bankruptcy. In Cuba, every Taino male had to pay a huge amount of gold every year or Columbus would have their hands cut off until they bled to death. 500,000 native peoples died within 50 years of his arrival. Columbus helped establish the African Slave Trade. Columbus established the trading routes between Europe, Africa, and the Caribbean. He and his crew spread syphillis all over the islands. He treated all of his “loved ones” and employees like crap. He abused his wives, sons, brothers, and employees. He was so cruel and tyrannical that his crew took him to court for how big of a jerk he was.